Today’s CardRunner’s instruction comes from utility coach PoorUser, who comes to high-level poker with an advanced degree in Starcraft, a military science fiction strategy video game. Clearly CR is assembling an ever-expansive crew of instructors comprised of the coolest party animals on campus. Remember, you can geek out for profit by studying with CardRunners poker trainers for free via TrulyFreePokerTraining.com. With the Â£10,000 + 350 Main Event scheduled to start at 12pm London time Thursday, the final prelim event, Â£10,000 + 350 High Roller No-Limit Holdem Heads-Up will come to its conclusion at 3pm. Four players remain with the two winners playing a best-of-three final shortly after both matches are completed. For results from day 2, check out PokerNews or WSOP.com. PokerStars LAPT Grande Final – Rosario, Argentina :: Final stop of season 3 features a $5,000 Main Event. Can Jose “Nacho” Barbero win his 3rd LAPT event this season? PokerNews and the PokerStars Blog provide updates throughout the tournament. November Niner Matt Jarvis tweeted over the weekend that Sorel Mizzi would coach him in preparation for the WSOP ME final table. * Credit to Donnie Peters at PokerNews. Event #4 will take place at 5pm London time Tuesday, the Â£10,000 + 350 NL Holdem High Roller Heads-Up event. The field will contain a maximum of 128 players with registration closing when the tournament starts. In case of an unevenly sized field (more than 32, 64, or 128) there will be byes for round 1. WPT Borgata Poker Open – Atlantic City :: Day 2 underway, just over 200 players remaining with the top 100 making the money. A brawl almost takes place just before dinner as described by BJ Nemeth here. Other updates and goings-on here. Heartland Poker Tour – Black Hawk, Colorado :: The poker tour that people forget keeps chugging along with Mark Dunbar taking down over $180,000 in defeating a field of over 400 players. HeartlandPokerTour.com has the recap. Sorry to leave any ‘Ati-first readers hanging for a week without easiest access to the latest Tao of Pokerati take on happenings at the World Series. 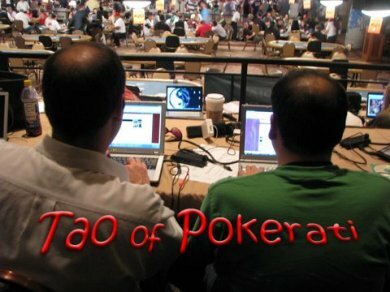 Of course you all are smart … and presumably know to find any episode you (or I) may have missed in the Tao of Pokerati podcast archives here. Seriously, check ’em out … there’ve been some good ones. Pauly skipped town a couple days ago … I guess with Rio security responding to all the billboard advertising around their property for Dr. Reefer, the Happiness Consultants, Legal Cannabis Scrips ‘R Us, etc. by cracking down on 420 breaks at the WSOP, Pauly decided if he was gonna leave the Rio, he might as well keep on driving (then flying) to the nearest Phish concert. But no worries … He’ll be back in a few days; in the meantime Benjo and I gotcha covered. Last night, with two final tables going on at the main stage, we found ourselves in one of those spots where two additional bits of exciting Amazon action were taking place simultaneously, with galleries overlapping in a single aisle as remaining players were well past their bubbles and getting nearer to big-money prizes. There’s a real s’affrontent going on in the $10k heads-up, with Bertrand Grospellier, arguably the #1 player in France right now, battling Benjo’s pal Lucovic Lacay, currently the top contender capable of dethroning him. All the excitement has the French guys on the rail madly … kissing? Benjo breaks down the questionable nature of these public displays of Euro-affection. NOTE: Lucovic would end up beating Elky, who earned $38k in the Round of 16, while Lacay moved on to the final 8 where he is guaranteed at least $92k. DonkeyBomber‘s going deep in the Seniors event, but did Dan ruin his chances for a bracelet in “the oxygen event) with some inappropriate touching? Player superstitions aside, there’s some real concern about Toothless Bob, who was going into this event as the Team Pokerati favorite but may or may not have shown up to play.